The cartoonists for the comic strip "Crankshaft" must live in Tucson! There is another Super Typhoon out in the west Pacific - currently winds estimated to 170 kts. Current forecast from the JTWC (Joint Typhoon Warning Center) is shown at top. Just above is an IR image focused on the storm at 1132 UTC this morning and below is the global view at 0600 UTC. The typhoon is forecast to hit the north island of the Philippines in about five days, but to be in a weakening mode. Nearly 50 years ago there was a deadly outbreak of tornadoes across the upper Midwest (states with tornadoes were IN, OH, MI, WI, IL, and IA) on Palm Sunday 1965. Palm Sunday that year was on April 11th. This was the largest outbreak of tornadoes on a single day up to that point in our recorded weather history. There were at least 47 tornadoes and fatalities exceeded 261 people. The image above has become an icon of severe storm photography and was taken by Paul Huffman near Elkhart, Indiana. It captures a double vortex tornado crossing a highway and railroad tracks - the tornado is so close that debris can be seen in the air near left side of photo. 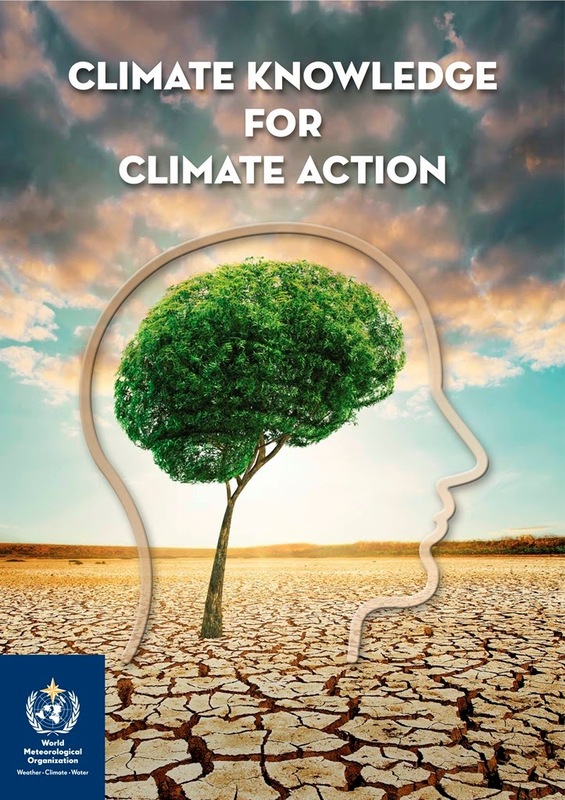 Fujita et al. published a detailed study of the event in Monthly Weather Review (January 1970 issue) and the abstract is below. 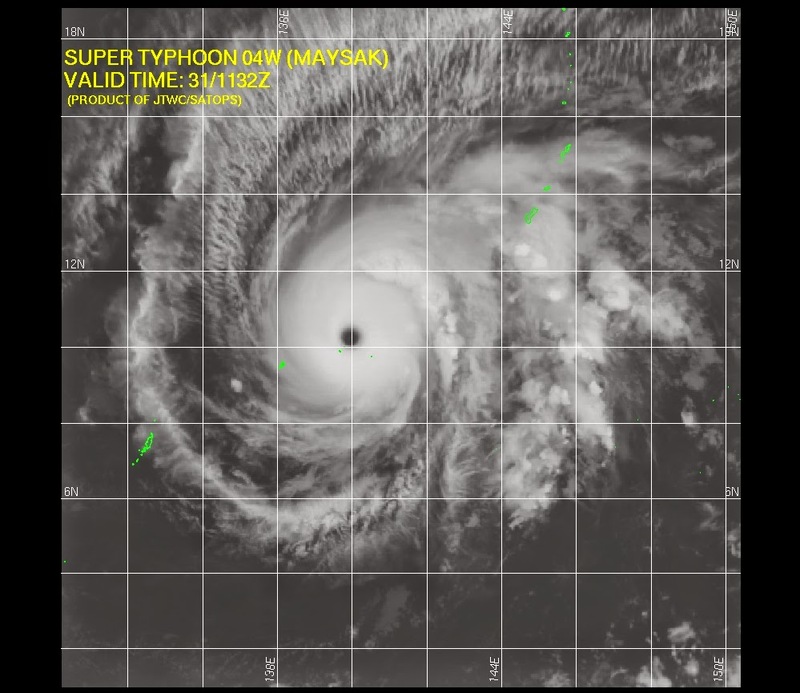 Fujita's aerial survey documented numerous tracks of looping, "suction spots", which are now known to be damage tracks of sub-vortices embedded within multi-vortex tornadoes. The paper demonstrates how crude the radar and satellite data were 50 years ago. I remember that day vividly. I was a junior in college and was home, in southern Illinois, for the Spring/Easter break. I was playing golf that afternoon with my Dad and several others at a course on the Mississippi River bluffs east of St. Louis. The dryline came through and we finished our round in winds gusting to at least 50 mph from the southwest. Even though the area was within a tornado watch, all of the thunderstorms and tornadoes occurred far to the north of where we were. This year the severe thunderstorm season has been very calm so far. 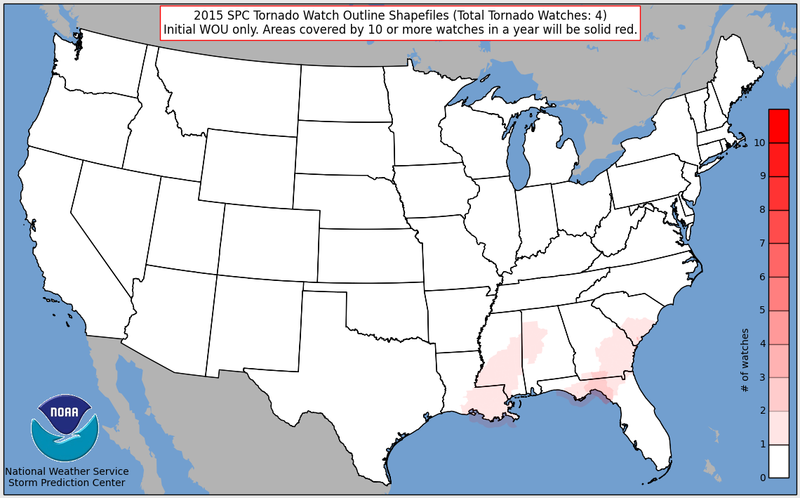 The two maps here are from SPC and show the areas affected by tornado watches above and severe thunderstorm watches below - only 4 of each flavor have been issued so far during 2015. A weak 500 mb low west of Baja will impact our weather the next several days - mainly by spewing some high and middle-level clouds across southern Arizona. The WRF-NAM model (06 UTC run) currently forecasts some weak radar echoes over southeast Arizona tomorrow (above is forecast of composite radar echoes valid at 9:00 pm MST Monday). The forecast of PW valid at same time (below) indicates values reaching amounts just over half an inch. So, not surprising that the model forecasts little in the way of rain to actually reach the ground. Second graphic below shows the 500 mb forecast (on the 5.4 km grid) valid at 9:00 pm tomorrow. At that time the closed low is forecast to still be west of Baja, while a weak short wave to its north is inching across Arizona. The GFS average 500 mb heights from the ensemble runs are shown above (valid March 31st at 5:00 pm MST) and below (valid April 4th at 5:00 pm). The model indicates that the Southwest remains in weak flow through the next several days. But after that the main branch of the westerlies shifts southward as the Pacific ridge and split flow regime shifts (at least temporarily) west to the central Pacific. So even if precipitation with systems in early April stays north of us, we'll probably see some spring winds starting to blow dust and pollen around. Gesundheit! Sparkling clear skies again today over most of the Southwest. High this afternoon (above visible image from 1:30 pm MST) at the airport reached a record for the date, 93F, breaking the old record of 91F. Here at the house the morning low was 39F, giving another day with a very large diurnal temperature range. Some bright yellows out in the yard. Above, an agave doing its thing, with the waxing moon up there in the background. Palo Verde tree below, was a volunteer years ago, sprouting from a wind-blown seed. And a bit of red too, from blooming ocotillas below. 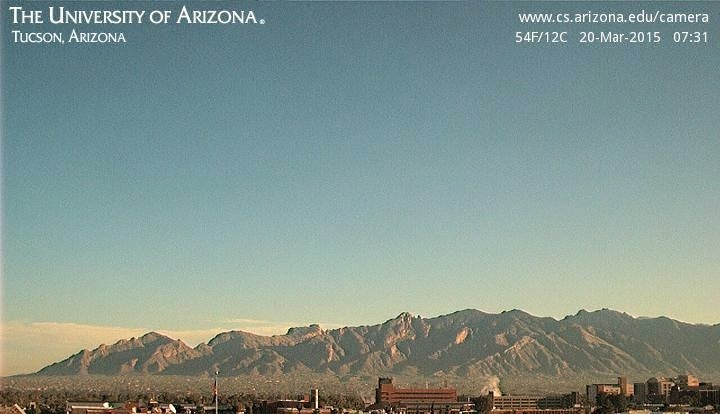 Clear skies dominate much of the Southwest this afternoon. Temperatures in Tucson area have climbed into the low 90s for the first time this spring and are close to the daily record for the 27th. More tomorrow. Edited to add: High at airport reached 93F today - one degree below the daily record of 94F. Low here at house this morning was 37F, giving a diurnal swing of about 56F up here along the Rillito. Winter is still hanging on in parts of the country as March winds down. 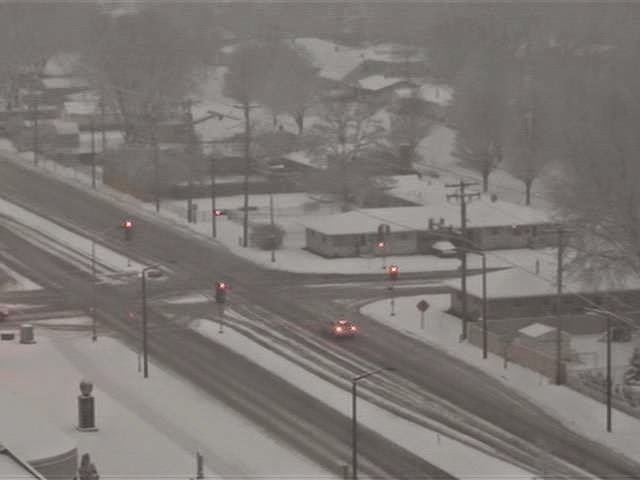 Above is a view in Green Bay, Wisconsin, early this morning (Wednesday, March 25th). Here in Tucson area there has not been much to talk about this week. It's been dry and sunny, which leads to continued big differences in low temperatures here along the Rillito versus the "official" lows at the airport. Yesterday was fairly typical of much of the month - low here at house was 37F, while low at the airport ASOS was 50F. Dewpoints yesterday afternoon dropped into the single digits at the airport and the high temperature hit 84F. The WRF-NAM forecast (from 00 UTC last evening) above is for PW valid at 6:00 pm MST tomorrow, the 26th. Note that the entire domain is forecast to have PW of less than 10 mm - so dry continues to be a main weather word here, as will hot by the weekend. 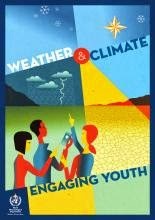 Above is this year's WMO poster and below is that from 2014. Saw a bird I'd never seen before on my walk this morning. 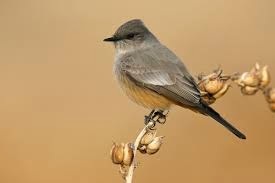 I think it was a Say's Phoebe (a flycatcher), shown above (not my photo). After a chilly low of 40F this morning, temperatures now up into mid-80s. 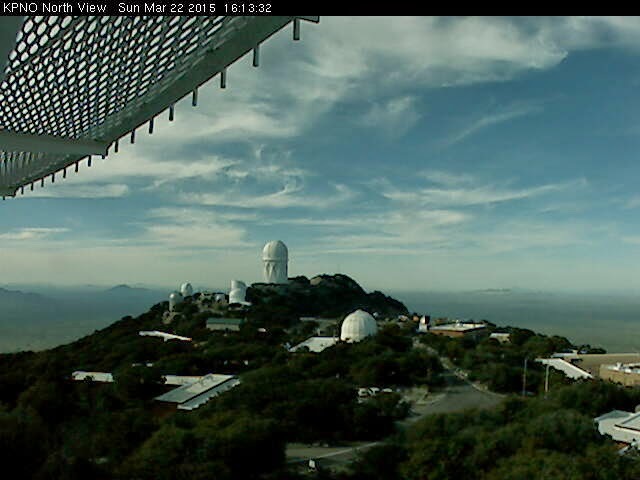 Kitt Peak web cams a bit before 4:30 pm MST show cirrus to the north and clear skies deep into Mexico to the south. The GFS 500 mb ensembles (spaghetti chart above) continue to forecast a ridge dominating western North America (charts above valid at 12 UTC on March 29th). Considerable "spaghetti" within the weak, southern branch of the split flow regime over West and east Pacific. Looks like cold trough prevails over the eastern U.S., where Spring is a bit delayed this year. 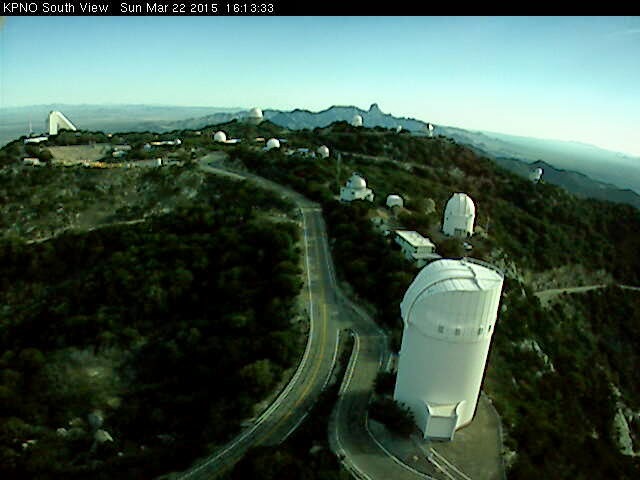 Atmosphere over southeastern Arizona dried considerably during the day yesterday (PW was at 0.75" at 12 UTC but had fallen to 0.39" by 00 UTC) resulting in only isolated moderate buildups over higher elevations (as per 6:00 pm view of the Catalinas above). There were some puny Cbs around eastern Pima County, but most substantial thunderstorm activity was far to north and northeast. Below is 24-hour precipitation through 6:00 am this morning (from MesoWest), showing very little happening yesterday. For the coming week (as per the GFS ensemble forecasts' average 500 mb heights), we'll start with zonal flow, with stronger flow far to our north (top, valid at 12 UTC on the 24th). But by the end of week the GFS forecasts a strong re-building of the western U.S. ridge (below valid at 00 UTC on the 28th). Flow does remain weak and chopped up over Arizona and northwestern Mexico, so the most unusual warmth will be over Utah and northward. We are heading rapidly toward our dry and hot months of April through June, and so time is running out for a final, significant rain event for southern Arizona. Today is the first day of astronomical spring, as the sun begins its northward trek to summer. Officially spring begins at 3:45 pm MST this afternoon. Our meteorological spring started back on March 1st. Regardless, today has dawned clear and sunny - above at 7:30 am and here at the house we are enjoying a riot of penstemons blooming almost everywhere (below). Yesterday's coverage of rainfall across the ALERT network was down considerably from Wednesday's 100% areal coverage. 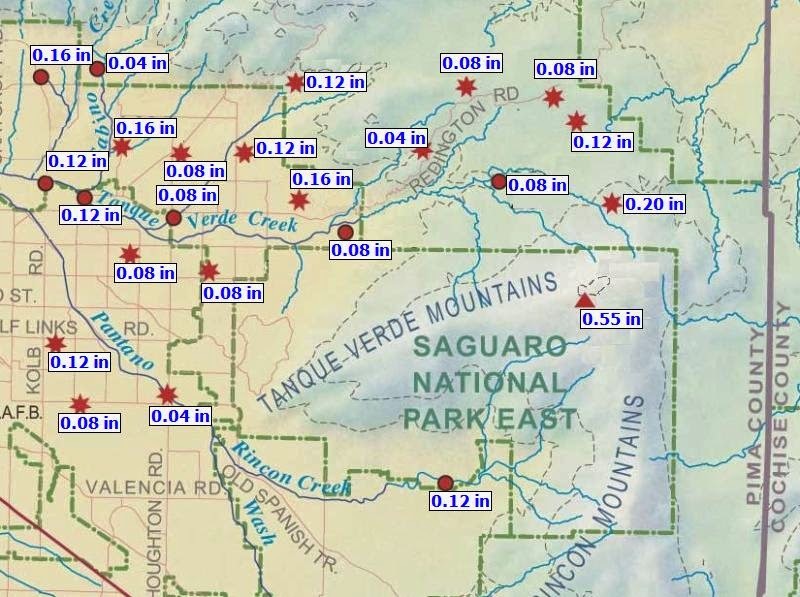 At 7:00 am MST this morning 40 sites had measured rain during past 24-hours (bit over 40% coverage), with the northeastern portions of the network and metro Tucson being almost skunked (above is metro west sector and below is southwest sector). 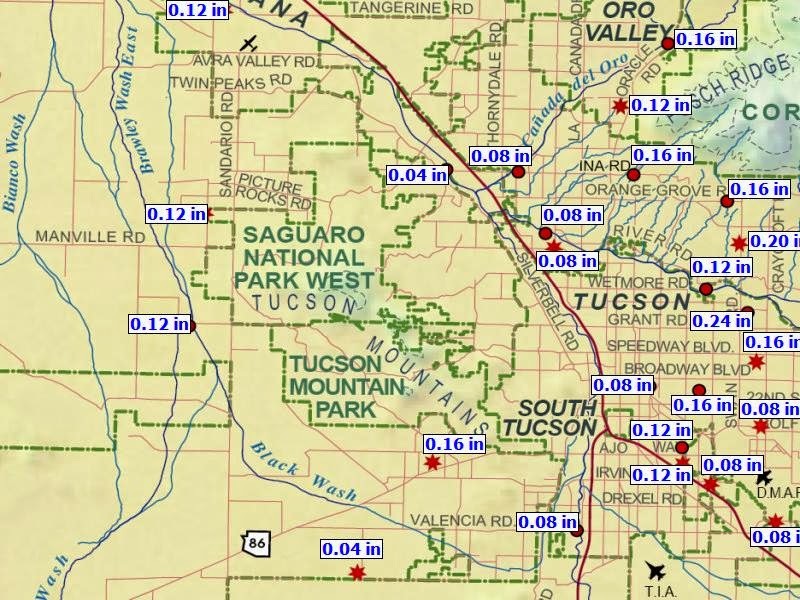 Thunderstorms to the west and south produced a few spots of heavier rain (most amounts were well under 0.20"), with 7 sites having 0.25" or more (max of 0.83 at Tubac, on the far south edge of the network). Almost a summer-like afternoon, with fairly widespread thunderstorms affecting Arizona, New Mexico, and Mexico - second graphic below shows detected CGs through 8:00 pm MST (from Vaisala). Today, our Easter-egg shaped, 500 mb closed low continues over central Baja (above 12 UTC analysis from NCAR RAL) with quite cool temperatures over the Southwest. The persistent ridge continues from the Northwest U.S. across western Canada, with the flow splitting about over Mt. Shasta, California. The TWC sounding plot (below from SPC) indicates a touch of CAPE at low elevations, given some sunshine today. Steering winds have almost vanished, so afternoon storms over mountains won't go far, although some may drift over lower elevations. 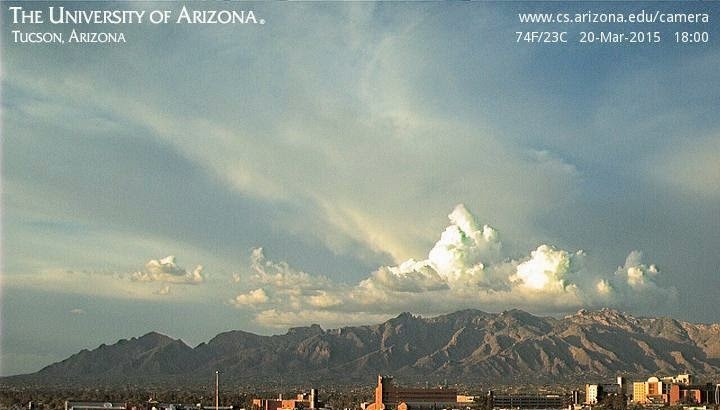 Almost like summer, with a number of thunderstorms drifting around southeast Arizona this afternoon. Visible image above is from 2:30 pm MST and radar composite chart below is for a bit after 2:15 pm. 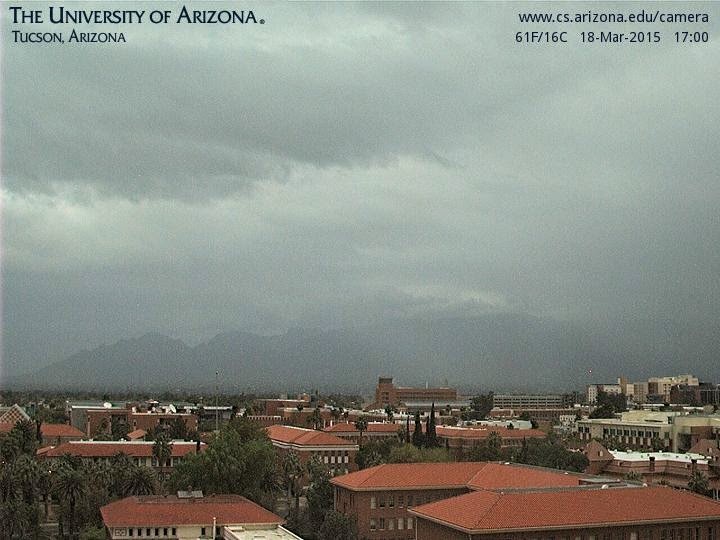 Showers moved into the metro area late yesterday afternoon - above is view of Catalinas from campus at 5:00 pm MST. By 8:00 pm every station across the ALERT network had recorded measurable precipitation, making the NWS POPs of 40% quite conservative. Shown here are the metro west (above) and metro east (below) sectors of the ALERT network for 24-hours ending at 5:00 am MST this morning (Thursday, March 19th). 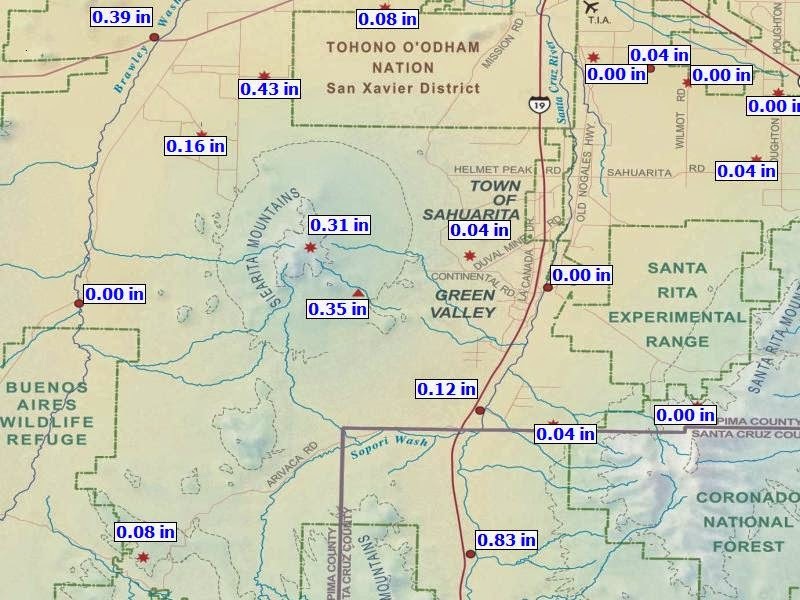 Amounts at lower elevations were mostly 2/10s of an inch, or less, However, three stations in Catalinas and Rincons measured over half an inch, with a max of 0.63 inch. Here at house we had had 0.14" by 8:00 pm. There were some isolated thunderstorms over southeast Arizona, but most thunderstorms occurred over southern California and northern Mexico. Graphic below shows detected CG flashes through 11:00 pm yesterday night. The WRF-Nam continues to forecast small amounts of CAPE for this afternoon, and there may be more thunderstorm activity as the closed low at 500 mb slowly approaches across southern Arizona and northern Mexico. 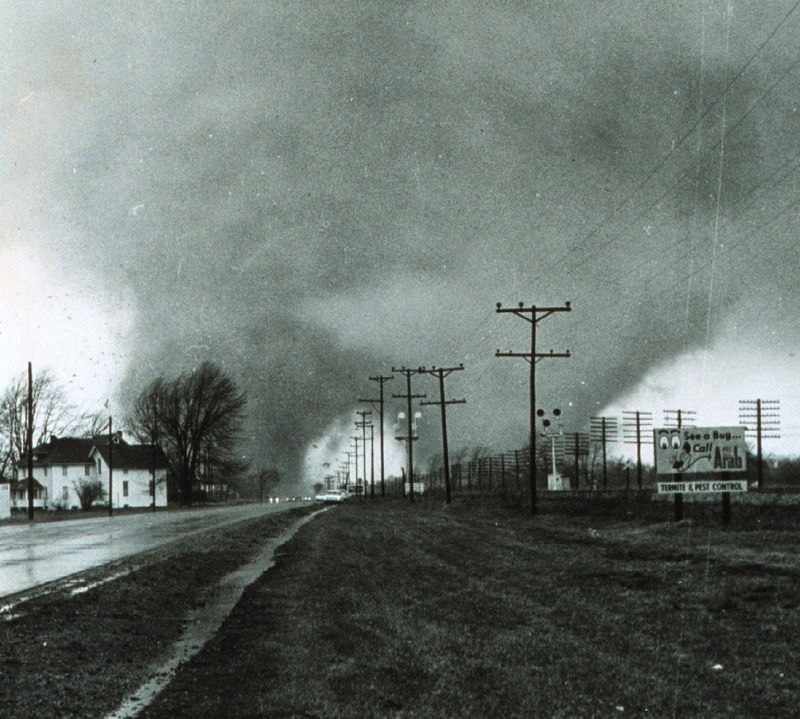 Ninety years ago today the most devastating tornado ever documented occurred in the Midwest. It is referred to as the "The Tri-State Tornado" because of its track across Missouri, Illinois, and Indiana. 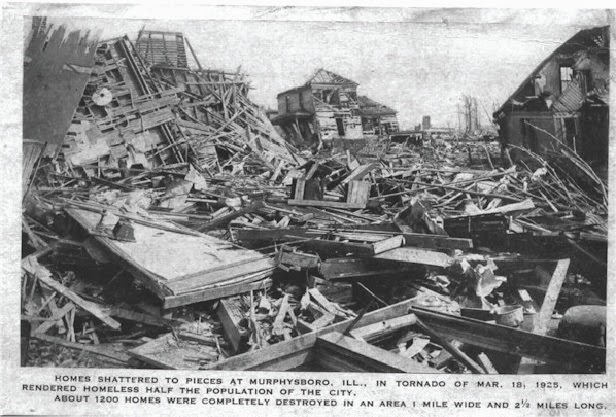 The newspaper photo above shows destruction in Murphysboro, Illinois. 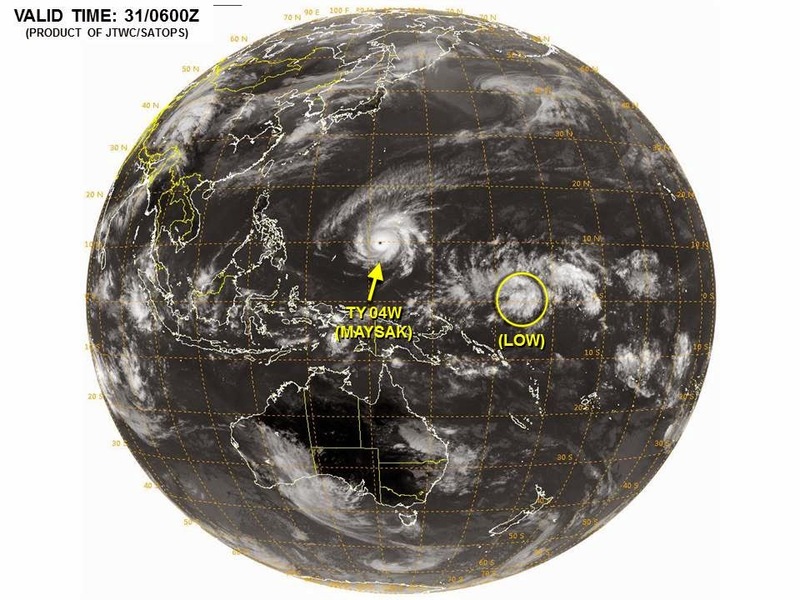 Figure below shows the track, with other details, as reported by Changnon and Semonin in Weatherwise. Figures here illustrate some of what we were able to do in our study. Above graphic shows time continuity of the position of the surface low, tornado, dry line, squall lines, and warm front from 0700 to 1900 CST on 18 March, 1925 (these results are very much different than those reported during the years following the event). Figure below is our new track figure that was developed using historical records, photos, newspaper accounts, reports, and books. But the most important inputs came from survivors who were willing to help the team, many of whom vividly remembered the events of that day and the aftermath. Some were able to take team members on driving tours and describe exactly where and what had been destroyed, as well as to point out features that were not impacted by the tornado. Track below is composed of hundreds of individual damage points identified and the positioned using GPS. Obviously, much of what our team did would not be possible if we had started much later than we did. Bottom shows an Indiana Memorial Marker along the track. The rest of this week should be quite interesting, as the next 500 mb S/W and closed low move slowly across southern Arizona and northern Mexico. There are already light showers and sprinkles across portions of southeastern Arizona at 6:00 am MST this morning - above. The WRF-NAM forecasts from the 06 UTC run get PW up to around an inch and develop some CAPE during next 60 hours or so. Shown below is the forecast sounding for TWC valid at 3:00 pm this afternoon - certainly a potential for some thunderstorms is forecast by the model, with best CAPE over the mountains and where/if some sunshine breaks through. By Thursday the forecast for 500 mb (above valid at 7:00 pm MST on the the 19th) indicates the closed low just to our west, with fairly cool temperatures in middle-levels. So a very good potential for moderate to heavier showers. The WRF-NAM forecast of accumulated precipitation through 11:00 pm on Friday the 20th (below) indicates a general rain event for southeastern Arizona, with some nice amounts forecast for Cochise County and the White Mountains.